Community policing, as a philosophy, supports the systematic use of partnerships and problem-solving techniques to proactively address the immediate conditions that give rise to public safety issues, including crime, social disorder, and fear of crime—as opposed to responding to crime after it occurs. Community policing expands the traditional police mandate. It broadens the focus of fighting crime to include solving community problems and forming partnerships with people in the community so average citizens can contribute to the policing process. Originating during police reform efforts of the 1970s, the philosophy of community policing is currently widespread and embraced by many citizens, police administrators, scholars, and local and federal politicians. What sorts of collaborative partnerships have evolved between policing agencies and the individuals and communities they serve? How do police departments engage in systematic examination of identified problems to develop effective responses? How have police departments aligned their organizational structures to best support community partnerships and proactive problem solving? Just how effective have efforts at community policing been? These questions and more are explored within the pages of this new reference work. A collection of 150 to 175 entries are organized in A-to-Z fashion in one volume available in both electronic and print formats.Signed entries, authored by significant figures in the field, each conclude with Cross-References and Suggestions for Further Readings to guide students to in-depth resources.Brief "What Works" case studies within appropriate entries profile community policing programs and strategies as tried in various cities and communities.Although organized in A-to-Z fashion, a thematic "Reader's Guide" in the front matter groups related entries by broad topic areas (e.g., Foundations; Methods & Practices; Legislation & National Organizations; Changing Agency Culture; Planning & Implementation; Training & Curriculum; Assessment & Evaluation; etc. 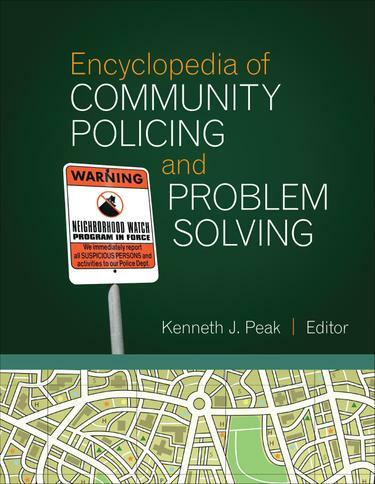 ).Also included in the front matter, a Chronology provides students with historical perspective of the development of community policing.The entire work concludes with a Resources appendix listing classic books, journals, and associations, followed by a comprehensive Index.